So last week, I looked at 'partially protected' turns at a crossroads and this week, I thought it might be helpful to look at a T-junction variant. The reason I looked at the crossroads was that on the side streets, there simply wasn't space within which to build cycle tracks which would allow a fully protected junction and so people cycling into/ out of the side streets would have to join/ leave the carriageway. As before, cyclists move at the same time as pedestrians. Cyclists turning left will be held on a red low level cycle signal (LLCS) until the walking/ cycling stage ends and they will get a green just before side road traffic is released. On the other side of the junction, you will see a little right turn 'pocket' inset from the main cycle track - for right turning cycle traffic of course. In the same way as people could turn right from the cycle track in last week's example, people could turn right from the pocket at the same time as the cycle traffic. This variant complicates matters a little, but it means that southbound cyclists are held on a red when the side street runs on green. This is of course far less convenient for cycling and perhaps overly cautious. The thing I'm tending to see with designs such as these is that the pedestrian crossings are often being installed as staggered 2-stage variants and often only on one arm of the main road. 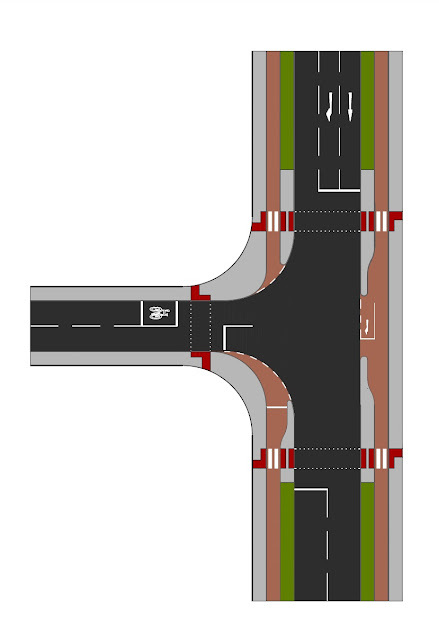 I've shown single stage and crossings on both main road arms. While I acknowledge the whole "don't make perfect the enemy of good" argument, we should be pushing for single stage crossings; especially if the provision of cycle tracks upset the pedestrian desire lines as they sometimes do. There are clearly lots of different ideas and elements at play and so it is important to work out where the main cycle traffic flows will be. If we have heavy movements from a side street to a main road, then we may well be looking at a different signalling arrangement than where cycle traffic is generally on the main road. Thanks - a helpful account. The last example mostly looks good to me. The corners of the waiting and entry area in the red circle on the right are still too square, they need to be rounded more. Bikes don't do square corners, and in this case entering bikes will crossthe white line separating them from the waiting area unless you round that white line corner off, or just add a triangle off the tail of the waiting area to your entrance bit. Yes, probably needs a little playing around with! The earlier design would work too, and eliminate the crossing cycle flows in the narrow entry-and-waiting bay, as long as it was really clear that the entry point for cyclists crossing from the side road isn't straight ahead but to the right of any waiting cyclists. 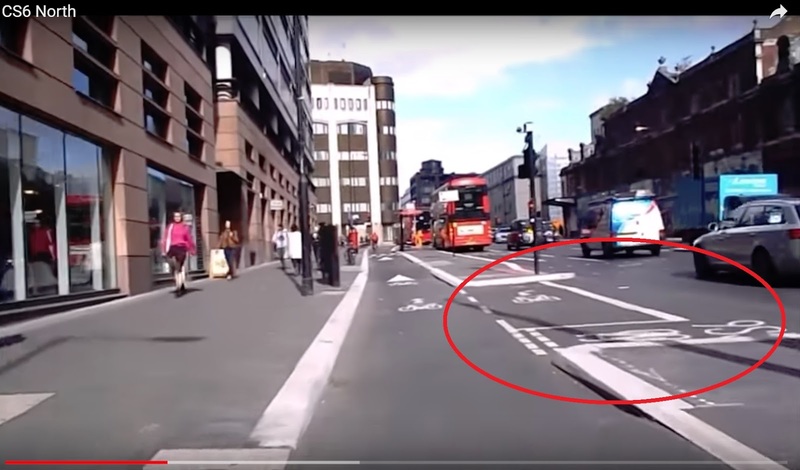 In Holland we'd put a curved dotted white line (marking the outside curve) along which the (cyclists and) cars that want to go right from the side street are supposed to drive, I don't know if that's usual in England? 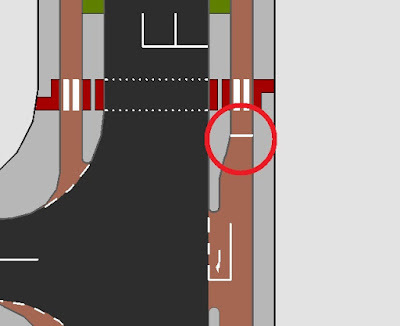 As the cars tend to treat a line like that as a lane marker, if you put it in place a little inside the outside curve, the cyclists can take the curve just around the outside and it helps cars to stay away from them (or if you put in a second dotted line it works like a cycle lane indication to the entry point). As cycles and cars share the lane in the side street, those will be released together. You cannot, in one traffic lane, hold the cars but let the bikes go with signals, as the bikes and the cars are interspersed. That means cyclists turning right from the side street will still be in danger from cars turning left, as in your previous post. Forbidding left turns for cars from the side road would be the only way to avoid that that I can see, if there is much heavy traffic turning left from the side road. Sorry, I should finish thinking before posting! Not being able to hold back the cars in the side road, when you want to let the cyclists from the side road go, *as long as they are together in one lane*, is the reason why in Holland very often a street without a cycle lane will get a very short little bit of cycle lane right before an intersection. It means that right at the intersection you have two lanes, one for cycles and one for cars, that get separate signals. That way, you can let the cycles cross safely, while holding back the cars that might left-turn across their paths and endanger them. 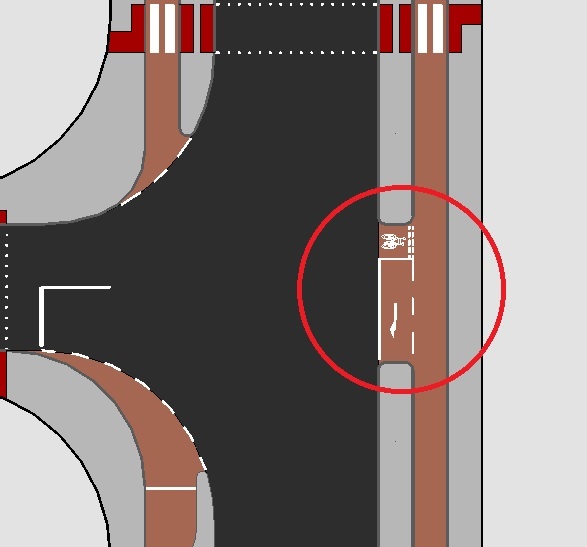 As long as you don't put in that (tiny, narrow) bit of separate cycle lane at the exit of the side street so you can give them separate light signals, you will not be able to make cyclists turning right from the side street safe from left-turning vehicles, unless you forbid (and enforce) left turns for cars. Sorry, I accidentally posted this reply to the wrong article, an essay by Robert Weetman about a side road treatment on an industrial estate. As it was meant for this city side road situation with an ASL that you set up, I'm reposting it here. It's tricky because UK rules are a bit restrictive, so we are still trying to work out how to push things. I saw let op in Amsterdam in quite a few places, so I get how that could work, we just can't run our junctions in the same way here.